Let me start with a confession: personally I don’t care much about digital modes. That doesn’t mean that I don’t keep track of the latest technologies, and (hopefully) this short review is proof of that. I’m not going to explain in detail what DMR (Digital Mobile Radio) is, as there are many sources on the Internet that will do a much better job than I could. For your convenience I uploaded a DMR primer, the link can be found at the end of this article. What I would like to do here is give you a basic idea of what you can expect, and – just as important – what not. Talk around the world by using repeaters. The functionality isn’t much different from D-Star. Optimal use of frequency space (time slots). DMR uses 2 time slots, which makes it possible to have one frequency harbor two QSO’s at the same time without interference. Extensive encryption options to prevent eavesdropping (illegal for ham use). Unless you know one key (basic privacy) or two keys (extended privacy) other people can’t listen in. On-screen call sign recognition. In order for this to work you need to update the subscriber ID list regularly. 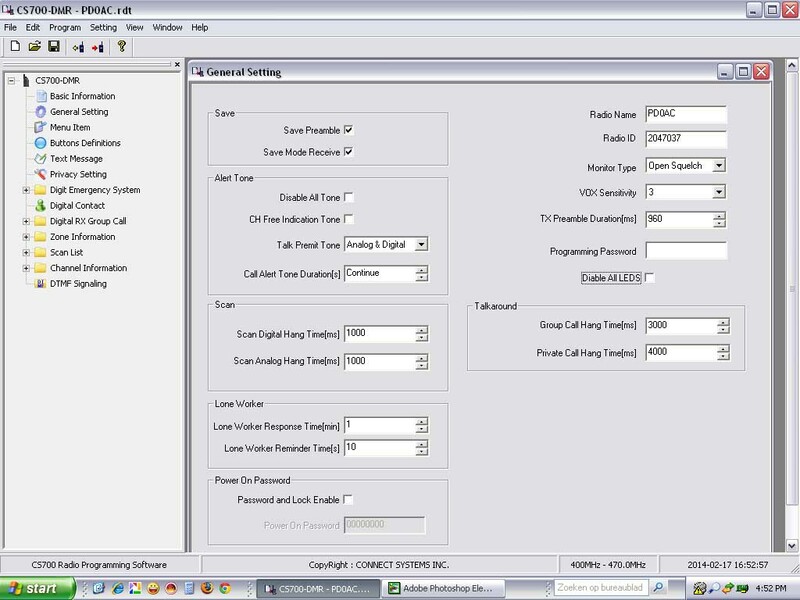 This will also open up the option to use ‘call routing’ (calling a specific station regardless of his/her location in the world). You can get your own subscriber ID here. Sending and receiving text messages. Think of it as SMS on a cell phone. You can compose messages on the fly, or program a number of preset messages. A technology tailored to ham radio use. It’s not. DMR was conceived with commercial purposes in mind. You won’t find any dual-band radios, for example. If you want to have a mature, ham oriented digital system, go for D-Star instead. Great audio quality. Seven out of ten times I wasn’t able to recognize familiar voices, not even from people I talk to on a daily basis. Most people sounded like they just had a root canal, with a truckload of anesthetics preventing them from forming words properly. It’s a bit less poor than D-Star, but opinions vary wildly. 100% compatibility between various brands. There are some minor differences between Vertex/Motorola, Hytera and this CS700, but making QSO’s will always work. Plug & Play out of the box experience. If you open the box the radio is nothing more than a clumsy paperweight. You need to program it. Using these things to the max without some basic computer knowledge. If you hate computers, DMR is not for you. The number of screens to-be-filled-in in order to make a so-called ‘code plug’ will initially make your head spin. Fortunately you can almost always download a ready-to-use code plug made by someone else. If Connect Systems did one thing, it’s making a splash. At €249 (Europe) the CS700 is by far the most affordable DMR Tier 2 transceiver available. Please note that the European price includes all taxes, transport from the USA to Europe, parcel insurance and the seller’s margin, while USA prices (as low as $180) might not. Contrary to earlier reports this radio is designed and manufactured in China, but it doesn’t breathe the poor workmanship you sometimes see in the world of Baofengs. This is a high quality, sturdy radio. Optional: programming cable. This might look silly because the radio is worthless without one, but it does prevent you from paying for cables over and over again if you buy more than one radio. Drivers, programming manuals and programming software can be downloaded for free at Connect Systems. New firmware releases will be posted there also. I only programmed 2 zones of 16 channels each, because that was all I needed for this review. The maximum number of zones is 250, but I doubt that you will ever need that many channels and zones. It was surprising to get this radio up and running almost instantly, and the first QSO was made within minutes. The audio quality is poor when compared to FM analog, sure, but it is totally noise-free. This can also lead to mistakes once in a while, because you can’t always hear when it’s your turn to talk. Setting the ‘Talk Permit Tone’ to ON will prevent confusion. Excellent. Better filters, good sensitivity, great selectivity. I can even connect the CS700 to an outdoor antenna, something I can’t do with a Baofeng. Even my Kenwood TMV-71 can’t handle the RF pollution here. The first thing other stations mentioned was that my TX audio level was low when compared to most other stations. At first we thought this might be a CS700 problem, but that proved not to be true. 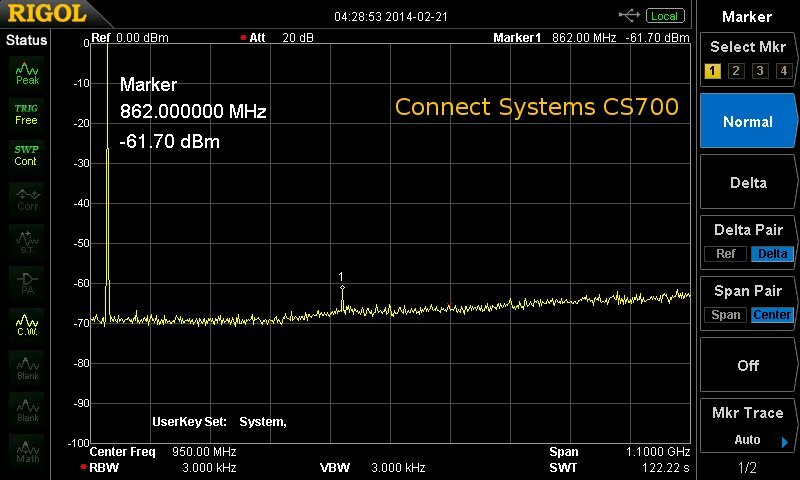 Actually, the CS700 did it right, and other radios did it ‘wrong’. As it turned out most users of Hytera radios had their digital microphone gain set to 18 or even 20, while 10 is the correct (factory) setting. The excessive gain setting not only resulted in huge audio level differences between stations, but made setting the RX volume on the CS700 almost impossible. I had to turn the volume just a fraction above zero if I wanted to listen to Hytera users without experiencing how fast a loudspeaker can self destruct. The latest Hytera code plugs made by PA2JM and PA3EHA have the gain set at 10, which results in all radios being equal. The same problem and solution is probably true for Vertex/Motorola radios as well. I’m not really impressed by the battery life. I could get about 8 hours of life out of it, with RX 95% of the time and TX 5% of the time. I did use the maximum power output, which is 4 Watts. Buying a spare battery is a necessity. Power output is slightly higher than the the factory promises: 4.2 Watts (high), and 1.1 Watts (Low). Harmonic suppression is excellent: -62 dBm for the second harmonics, third harmonics was undetectable. Most bugs are related to the programming software. You can keep track of bugs, fixes and workarounds in the CSI DMR Yahoo group. Only one bug is somewhat annoying: the slow scan speed for digital channels. This is a very nice, well designed and affordable DMR radio. Battery life could be better, scanning is slow, the radio can’t do roaming, but other than that there isn’t much else to complain about. Yet I wouldn’t immediately recommend a CS700 as a primary DMR radio, unless you have access to a local repeater. A mobile radio could be a more sensible option for your first steps in DMR land, but only you can decide. Connect systems, the company that started it all. VA3XPR did a very nice review of the CS700, highly recommended. Bamiporto.nl, the Dutch distributor. They also arranged this review sample. Ready-To-Go code plug for the Netherlands: see Download section for the latest version. Ik heb geen tijd meer om dat te testen met de CS700, de porto moet terug. Ik weet dat een andere amateur naar een dergelijk netwerk kan luisteren met een Hytera mobilofoon. Je schijnt daar nogal wat voor te moeten instellen, ik ving woorden op als ‘semi trunking’ en ‘color codes’, maar het fijne weet ik er niet van. Als je het precies wilt weten neem dan even contact op met PA3EHA (zie QRZ.COM). Wat op zich wel grappig is, is je opmerking over audio kwaliteit. Privé en beroepsmatig heb ik meer dan 25 jaar met analoge apparatuur gewerkt, waar je vaak alleen al aan de draaggolf kon horen wie je tegenstation was. Beroepsmatig zijn we een aantal jaar geleden digitale apparatuur gaan gebruiken en de kritiek was onder andere de slechte verstaanbaarheid van de apparatuur. Het gekke is dat je er aan went. Sterker nog, ik merk nu aan mijzelf dat ik analoge apparatuur vaak wat vervelend vind. Als het signaal wat slechter wordt bijvoorbeeld, word de audio ook zachter. Vroeger vond je dat normaal, nu is het vooral wat irritant. In feite is de overgang van LP naar CD hetzelfde. Vroeger vonden we een plaat met tikken en krassen charmant en maakte je je er niet druk over; het hoorde erbij. Als je nu nog eens een LP zou opzetten, al is het van je meest favoriete artiest, dan nog zullen vooral de tikken en krassen opvallen en de andere audio kwaliteit, die we nu slechter vinden. Stemmen herkennen via digitale apparatuur komt wel weer. Audiokwaliteit is iets wat vooral tussen de oren zit. Het is maar net wat je gewend bent. Ik heb van Yaesu de DMR portofoon FT 1 D en de mobiele FTM 400 set gezien en die zijn die beide dual band apparaten. Maar misschien bedoel jij alleen de apparaten met tijd sloten die enkelband zijn. Yaesu gebruikt niet de DMR Tier 2 standaard, maar heeft z’n eigen systeem wat ze System Fusion noemen. Het is net zo compatible met DMR als D-Star (niet dus!). Also I wanted to buy a CS-700 DMR. Does anyone have experience or the radio is recommended? The radio is excellent, I can recommend it without hesitation. I order currently in the Netherlands, the CS700 and need the PC cable. Can I Programming a standard PC cable with Kenwood pins using? I still have a cabel, with the I program and Puxing and Baofeng devices. Can I use this cable for the CS700? no, the cables are different and won’t fit, you need the original. Hans, heb je de CS700 ook op een extern geprobeerd en wat het resultaat? Ik twijfel namelijk tussen € 275 (+kabel) voor de CS700 of € 375 (+kabel) voor een MD785 en beide ex porto kosten (APD is hier zeer sterk). ik heb de porto vrijwel uitsluitend aan de buitenantenne hangen en kan de meeste repeaters dan bereiken. Front-end is goed, gaat niet plat hier. Portable ben ik afhankelijk van PI1DAF of PI1UTR. Thanks info. Overigens klopte de prijs die ik vermelde van de MD785 niet, dat is 370 +35 voor de kabel. 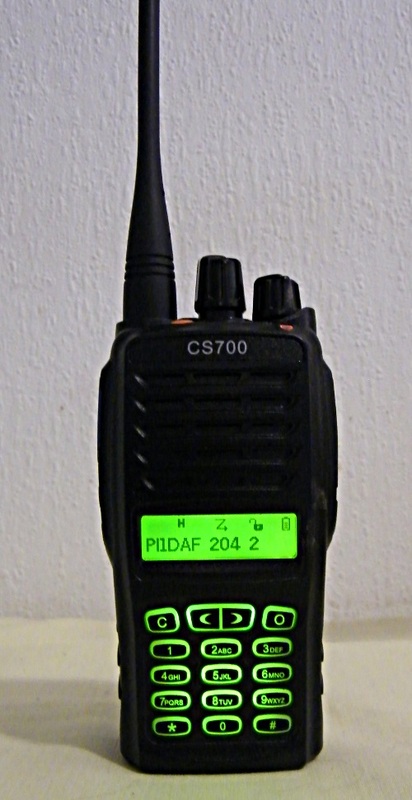 Ik krijg te leen een Chinese DMR porto maar geen CS700. Deze schijnt nog veel goedkoper te zijn. Ik schrijf een gebruikers review t.z.t. op mijn website. Kan er een externe mic. op de CS700 en is die ook verkrijgbaar? Ik krijg binnenkort de Luiton DG-318 te leen.